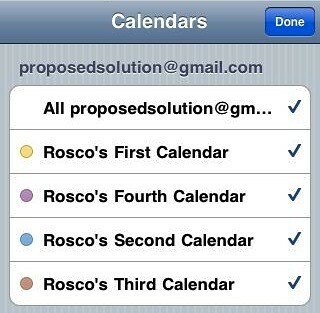 Can you see only one Google Calendar on your iPhone, iPod Touch or iPad? 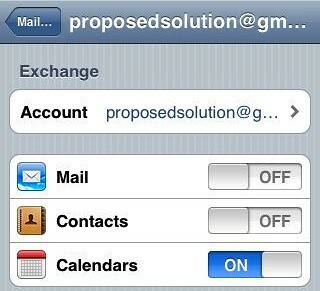 Like me, if you have multiple Gmail Calendars and you add your Gmail account to your ‘Mail, Contacts, Calendars’ screen on any iOS device (iPhone, iPod Touch or iPad) you’ll quickly notice that your device will only show a single calendar with no option to see the others. As frustrating (and strange) as this may seem, it’s relatively simple to resolve. I’ll include the steps to add Gmail email first and then the steps to get multiple calendars working. This applies to iPhone, iPad and iPod Touch running software version 3.0 and later. First step is to get the mail side of it working properly so let’s add your Gmail account for mail only. If everything is good, you’ll see Verifying followed by 4 checkmarks following by a screen with a Mail, a Calendar and a Notes toggle switch. Set the Calendar toggle switch to OFF – yes, you read correctly, OFF. I’ll explain later! Now we need to add Google Calendar but not through Gmail, through Exchange instead. Now you’ll see a screen with a Mail, a Calendar and a Notes toggle switch. The Settings screen will appear with a list of all of your Google Calendars – place a check mark next to the calendars that you’d like to sync with your iPhone. Now open your calendars app and view all of your Google Calendars with amazement and awe! How did you get on with this? Have you any tips you can share with other users? Join the discussion below. Really good idea of posting this information.I really appreciate. Really good post. Worked like a charm on my ipad 2. Thanks so much. i tried the CalDav approach which seemed to work except for I was no longer able to invite attendees. I followed the instructions you mentioned above, and it worked beautiful on my iPad2. Thanks sooo much! This is very user friendly – even for a novice such as myself! However, when I try to configure the different calendars to synchronize via m.google.com/sync I get the message that my device (iPhone) is not supported. Is there another way to configure google sync. Ignore my comments from above. Found the solution myself on google fora. Just make sure that you select the language “English”. Other languages will give the message that the device is not supported. I’m still learning from you, but I’m making my way to the top as well. I certainly liked reading everything that is posted on your site.Keep the stories coming. I enjoyed it! I absolutely can’t get this to work with my ipad 2. Not only with it not sync correctly with my ipad, just trying to get the calendars onto the ipad creates all sorts of events. It’s really frustrating! Worked PERFECTLY for my iPhone4! Thanks so much! great instructions! worked smoothly on my ipod touch 3g. i bookmarked your site for future reference. you’re an excellent teacher! thanks! Thank You, worked like a charm first time, have a great day!!! Finnish language has the same problem – changing to english makes it work. Very nice, at last all calendars there. thanks for the step-by-step guidance. works great!! Didn’t work for me as I do see the other calenders at the m.google.com website but they won’t appear on the iphone 4s my old iphone 3gs did work and both have OS5 so I don’t understand why it didn’t appear on the iphone 4s. any tips I can try? Hey- I went through these steps and it worked fine (and has been working fine for months) on my ipad. Just got an iphone though, and am unable to sync multiple calendars. When I go to https://m.google.com/sync/, I see that the calendars are already selected. I hit save, and when I go to my iphone calendar, only my main calendar shows up (not multiple calendars). Is it not possible to sync multiple calendars on both iphone and ipad?? Also, make sure you add the Google Calender account as an Exchange account and NOT as Gmail. 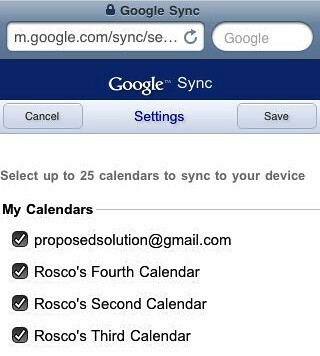 I AM syncing multiple Google calendars to my iPhone (4). I CAN’T sync multiple Google calendars to my iPad (4). When visiting https://m.google.com/sync (from the iPad) I get no login screen and therefore no “Manage Devices” screen? When visiting https://www.google.com/calendar/syncselect (from the iPad) I get the sync settings for my iPhone only. Strangely it’s a Danish site. I am from Denmark, but I have changed the language of Gmail and Goggle calendar to English (US) and even the iPad’s language to English. Wonderful. It worked perfect with the iPhone 5.